Knitting, spinning, tech editing, and general thoughts. Sometimes it's fun to make a baby hat that you would never in a million years wear yourself, but that would be adorable on a baby - and this is one of those. Named Presto! 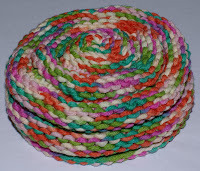 because it reminded me of the collapsible tophats used by magicians, it has alternating stockinette and reverse stockinette ridges that gather into each other. Because of this, as well as the natural stretchiness of knitting, the hat will fit for quite a while - just pull it a bit longer as the baby's head grows a bit bigger, or squish it a bit shorter for a smaller baby. Finished dimensions: 12in [30c] circumference; height is between 1.5 and 6in (4cm and 15cm) depending on amount of stretch. This is an appropriate hat for a preemie. If you are looking for instructions for this hat for baby (toddler, child, adult) sizes, please see my Beehive Cap, which is for sale as a charity pattern for the NC Cancer Hospital. Gauge: 14sts to 4in (10cm). Row gauge is unimportant. 1 set US 8 (5.0mm) needles - whatever you prefer to use for knitting small tubes. Note: instructions are given for preemie size, with newborn and baby sizes in parentheses. Join for knitting in the round, being careful not to twist, and place unique marker. Repeat knit and purl bands once more. Round 1: (K8, place marker) four times. Rounds 2 & 4: (K2tog; knit to marker) five times. Rounds 3 & 5: Knit all stitches. After Round 5, 30 stitches remain. Rounds 6 & 8: (P2tog; purl to marker) five times. Rounds 7 & 9: Purl all stitches. After Round 9, 20 stitches remain. 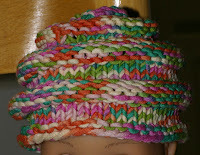 Rounds 10 & 12: (K2 tog; knit to marker) five times. Rounds 11 & 13: Knit all stitches. After Round 13, 10 stitches remain. Round 14: P2tog five times. 5 stitches remain. Cut yarn, leaving a long tail, and thread through remaining live stitches. Be careful not to thread it through the markers! Secure ends to inside of hat. All content in this blog, including patterns and photos, is the intellectual property of Katherine Vaughan. All rights under US Copyright Law are reserved. Teachers, please direct your students to download/print out their own copies of patterns used in class. You are, of course, welcome to use items knit from any pattern for charity or sale, with the statement "design by Katherine Vaughan" appreciated. Support the free patterns with a donation!